Alcoso made a nice Hunting Cutlass and this one is no exception. The fittings are all silver plated mounts. The fittings all have light period wear to the high areas. The quality triple etched and plated cutlass blade overall measures almost 14". This is a large weapon having a most impressive look to it. 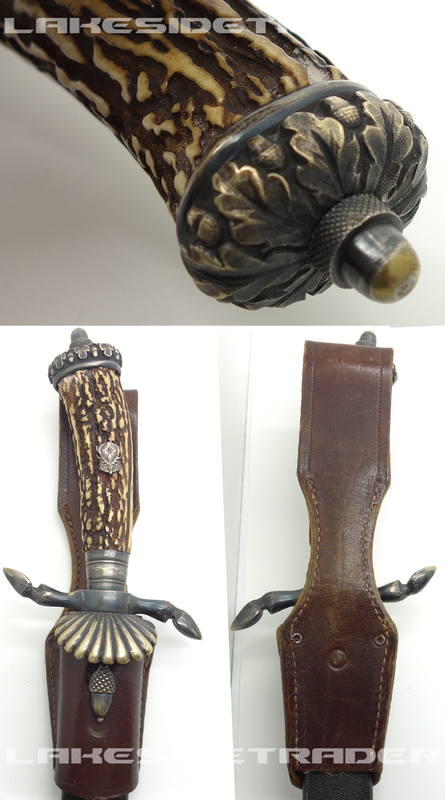 The pommel cap is very detailed having hand worked details. Look at the wee acorns and oak leaves all hand enhanced!! Man, this is why we collect! There is an acorn at the top that acts as the tang nut. The ferrule below is decorated with two pairs of rings around the circumference. The crossguard is the standard hunting type terminating with deer hooves. There is hand done hair put into the metal of the hooves and lower legs. The center area is of course a plain surface above the fluted clam shell. An exceptional piece of stag was chosen to compliment this weapon. The stag is a large diameter and it curves to the left. The stag has beautiful raised graining and a multitude of browns from black to yellow. The National Hunting Association insignia is correctly pinned. This hunting insignia again is silver washed with matching wear. On either side of the stag's head are the initials respectively of the Deutsch Jager Association, "D.J.". The scabbard shell is also a fine example having a composition base covered with fine grained green leather with a few small pressure marks but 100% leather coverage. Other than a tiny hit to the lower fitting it remains in perfect condition. The scabbard mounts are matching silvered type both having fine scalloped edges where they meet the scabbard shell. These mounts are retained by matching staples having numbers beneath. The triple etched blade is a beauty example. The etches are run on a usual horizontal. At the lower there are floral designs and then a panel featuring dogs searching for a fox. The other side features deer running towards the tip. The spine has a laurel leaf type etch running the length. This blade is in choice condition with just a few dots of age and rates easily in at Exc++. On the reverse riccasso is the logo of this firm stamped in the center. The original leather buffer is in place, finally nicely finishing this is a brown leather frog.